The tides are not super low for the weekend but from Monday onwards the low tides start, which is great for those looking to fish from the beach. You want to be on the beach as much as you can as the full moon approaches by the end of the week. More and more coho are accumulating everyday and bigger fish are getting caught. Last week was amazing especially if you were fly fishing of a boat. I hooked a lot of coho fishing at different tides and light conditions. I will say this again, change flies until one works for that time period and when it stops working put on a different colour of fly. 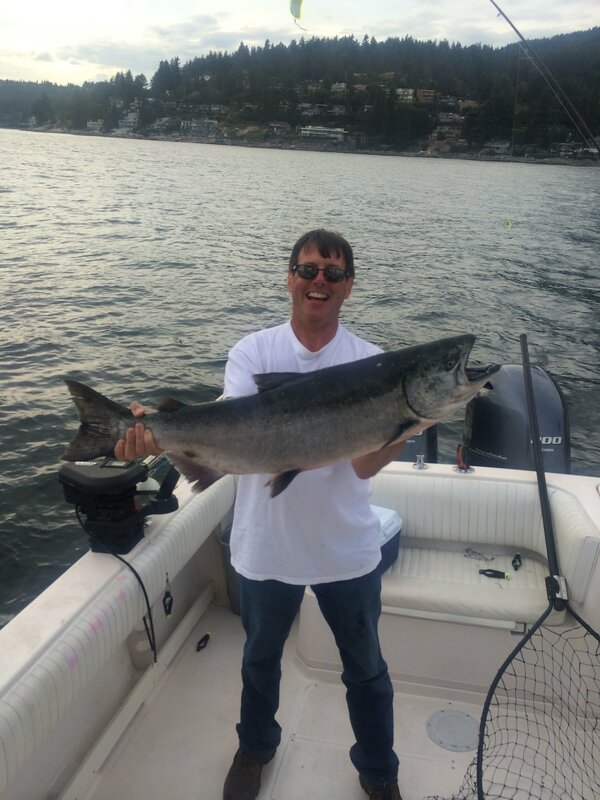 We are almost into August so be prepared to have a tougher time to catch coho as everyday they get more stubborn and are not willing to bite your fly but be persistent and at some point of the day, tide, light condition there will be one or more fish that will reward you for your hard work. As for pinks there are plenty of them around both at West Van and Furry creek. 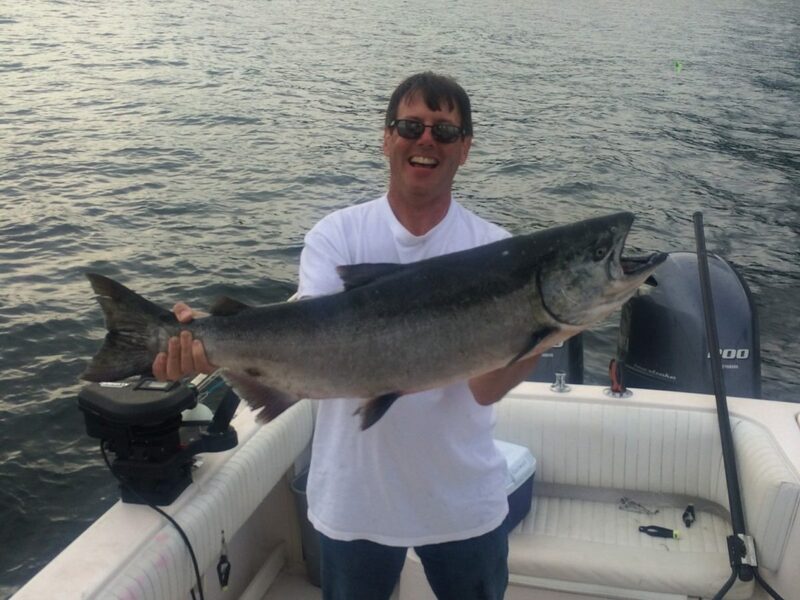 Andre with his biggest coho of the beach fishing season. 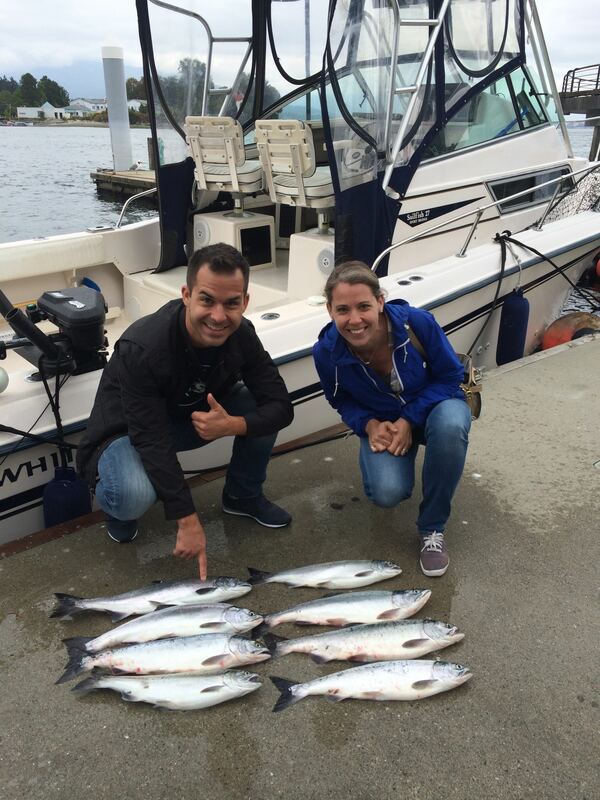 Fishing was awesome this week with lots of fish being caught off W. Van. Our guides Eddie and Dimitri and Warren were all into a lot of coho, pinks, and even a sockeye bit the gear this week. There were a lot of chinook hooked as well, both by trolling the coho and pink gear and getting chinook incidentally as well as using anchovies and targeting these larger fish. 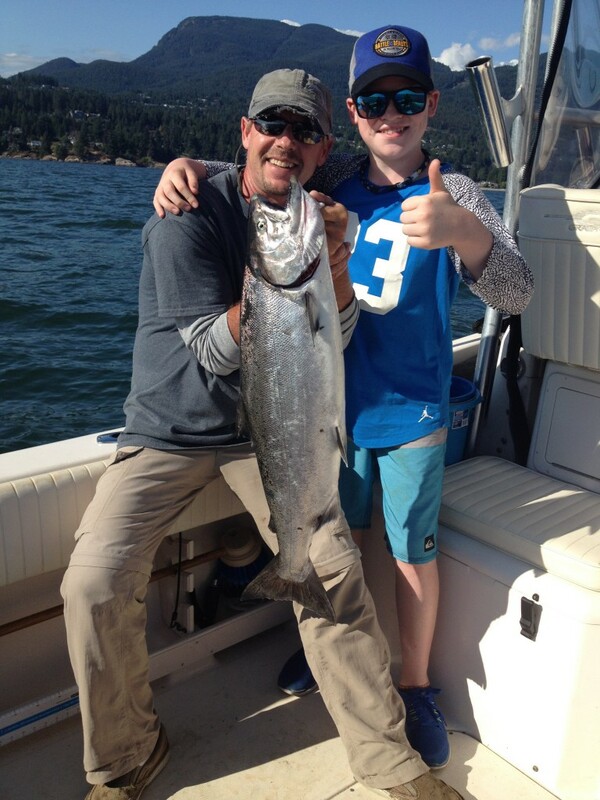 Alex with a nice chinook landed on a triple header this week! The white UV or white hootchy is still the number one producer for the coho on a fast troll, and by fast we mean at least a 45 degree cable angle. For detailed pictures of the flashers and hootchies we are using, look at last weeks report as we went into detail on what flashers and hootchies to use for coho and pinks off W. Van. Just a reminder that sockeye must be released with care as you will often catch sockeye on pink hootchies when fishing for pinks. Sockeye have a large eye, small scales, and no spots, and this time of year they are very chrome with a bright bluish green back. You can retain 2 hatchery coho per day and 4 pinks per day but your total daily limit is 4 salmon, regardless of species. So a lot of anglers are keeping 2 hatchery coho and then 2 pinks. Eddie’s guests with their catch! It was good to see more chinook being caught off W. Van and the Bell Buoy this week and this fishery will only get better as we get into August. A good way to approach the day is to fish for coho and pinks off W. Van in the morning and then focus on chinook later on in the day over at the Bell Buoy off Point Grey. 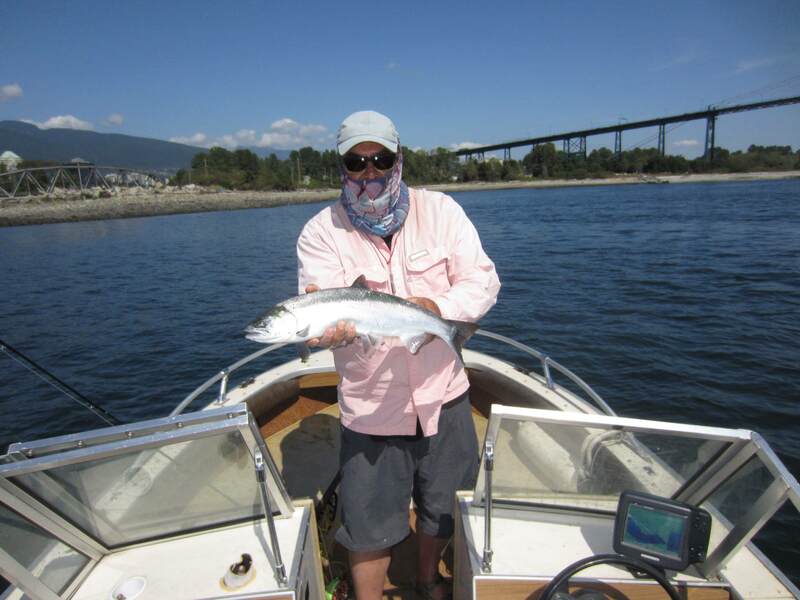 Brian with a nice chinook landed on a late afternoon charter. Now back to the pinks, we are really going to see a lot more show up in the coming weeks, so expect some good to red hot action by trolling pink hoothcies on a 28-32 inch leader behind your favourite flasher. We have a large selection of pink gear in stock right now like hootchies, spinners and spoons, jigs, and custom flies. We like to carry some fly rods and light spinning setups on our boats as in the coming weeks you will see large schools of pinks that you can cast flies or spoons to and the action can awesome. This is already happening up in Howe Sound as we have had some awesome days fly fishing for pinks from the beach as well as from the boat. Don’t be afraid to go exploring up in this area and look for schools of pinks showing themselves on the surface, especially from first light to around 10:00 am or so. After that they tend to go deep and jigging with pink lures works well or use a fast sinking line if you are fly fishing. 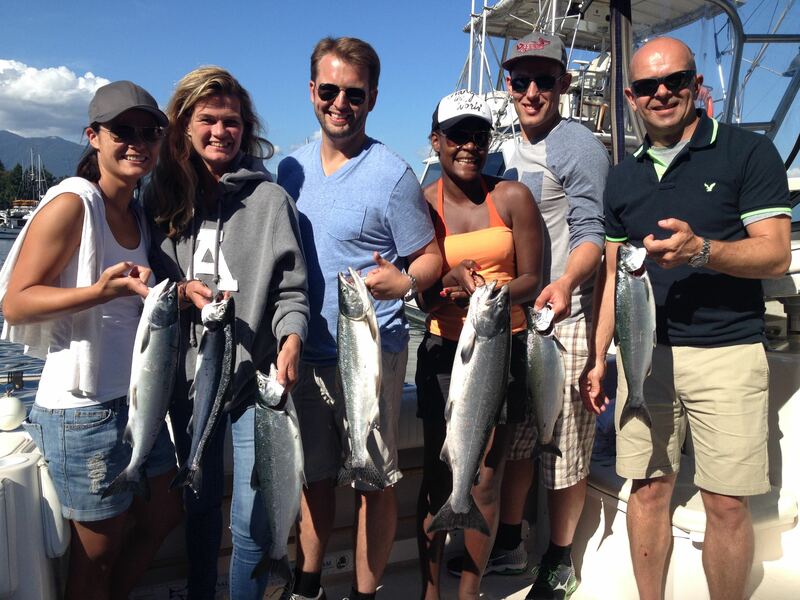 Dimitri’s guests with their limits of pink and coho. A very productive day! We will keep you advised of the situation on the Fraser Mouth as this area is currently closed and we are thinking it will open around August 1st. This will allow us to fish for chinook off the S. Arm and for pinks as well. It is not a guarantee that it will open August 1st, so check the regs before you head out. We will be talking to DFO before our next report on Friday, July 31st and will let you know what they say. The main concern is the Fraser is about 35% lower than normal for this time of year and about 3.5 degrees C warmer than normal. This means there could be an increased in river mortality for migrating salmon due to the low and warm conditions. The PA Saltwater Guide Team: Jason, Eddie, Dimitri, Warren.